One of the nice things about hosting this site is I can go back and see how I felt about different issues. 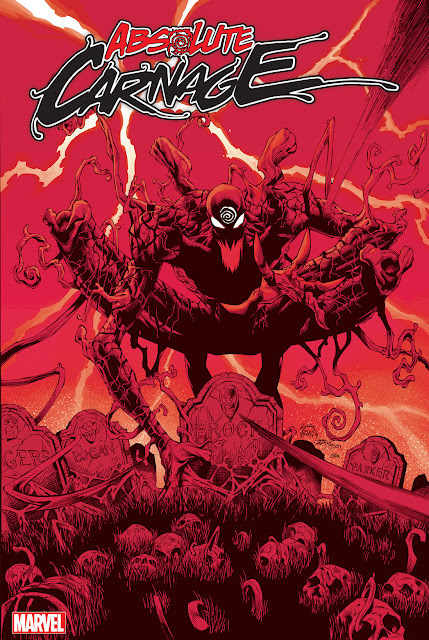 After finishing Carnage USA #1, I went back to see what I thought of the first Carnage mini. Turns out both first issues gave me the same reaction: awesome! Once again, the art is my favorite part. It is a lot cleaner (and less dark) than in Carnage. Without even knowing the character, you deduce within a few pages that Kasady is not your typical super villain; he is pure evil and psychotic. As many of you have already commented on in the preview pages, the final page (much like in the first mini series) makes every symbiote fan salivate for more! As much as I love Remender on Venom, Wells (author of Carnage USA) makes me excited to turn the page (and get goosebumps at the end of each chapter) like no other. So let the comments flood in! What was your first impression? What do you think the last page means for the rest of the series? Do you hope Wells and Crain (artist) continue making Carnage minis?